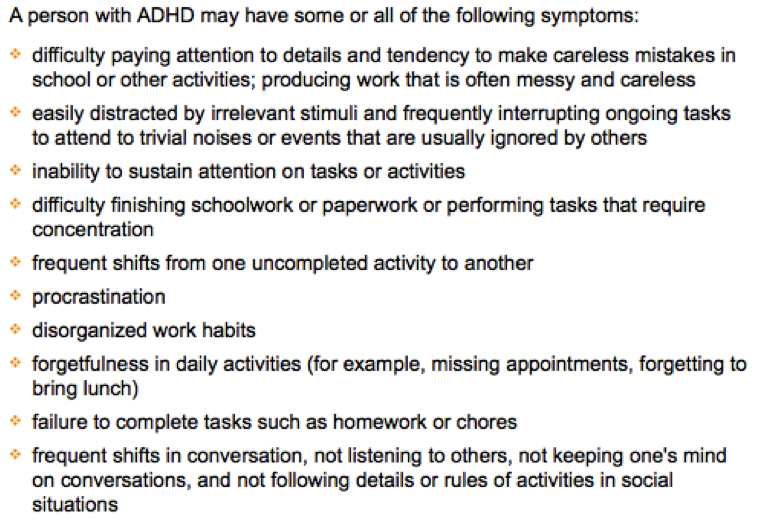 Attention Deficit/Hyperactivity Disorder (ADHD), more commonly known as Attention Deficit Disorder (ADD), is a neurological condition that has a genetic component and can be aggravated by environmental and physical factors. The negative characteristics of ADD include a tendency to procrastinate and miss deadlines, impatience, and an inability to focus among other traits. “Marked by distractibility, inner frenzy, and impatience, ADT prevents managers from clarifying priorities, making smart decisions, and managing their time. This insidious condition turns otherwise talented performers into harried underachievers. And it’s reaching epidemic proportions. Perhaps the biggest implication of our new speed is what this is doing to our lives, and in particular to our brains. Recently, I was in the boardroom of a government organization outside the U.S. that was in charge of regulating what should be a slow-moving industry. They were decades old, with around 10,000 employees and mountains of money. Their biggest challenge? "Our people are so overwhelmed, no one has any time to think, it's all too much," their executives explained. David Rock, cofounder of the Neuroleadership Institute, a consultant and author of Your Brain at Work. We all need to focus, shut down every day and decrease the amount of needless and useless information stimulation that is getting in the way of important and productive work. See more from David's excellent article on the Fortune website. Focus in 90 minute sessions without distractions (phone calls, emails, texts) for thinking work. You and your leadership team spend months putting together your yearly plan leading up to the start of your coming year through off-sites, conference calls, one-on-one meetings, cascading team meetings, summary meetings, draft plans and budgets and then final plans and budgets. These all get summarized in a handy presentation, spreadsheet or printed binder and it promptly get’s filed while people go back to doing “their real work.” Then, when the next quarter-end comes around there’s a collective “D’oh!” as people recall what they said they’d do in the plan, but didn’t quite get around to it yet. Sometimes this goes on for years. Where does the performance go? A lot of it gets lost in translation. How does beacon help to close the Strategy-to-Performance Gap? We simplify, support and automate a set of complementary, evidence-based, high-performance work practices, that ensures very little gets lost in the translation of your strategy on the way to execution. And when your plan gets “hit” from unexpected events (because no plan survives first contact with the enemy), you can quickly adapt and bring everyone along. If you think of the items we have outlined in the Noise section as symptoms, the Science-to-Business Gap should be classified as one of the diseases that causes these symptoms. I'll write about four other diseases in future posts (Sublinear Productivity, Strategy-to-Performance Gap, The Engagement Gap and Organizational ADHD). Each of these produces a number of unwanted symptoms and impediments to good performance in your organization. If you can head these off before they take root then you'll be ahead of your competitors. Closing the gap between research and practice (or what science knows and what business does) represents a change from the dominant approach to management behaviour – which operates more on intuition, anecdote and experience. And if we want to move away from commonly used management practices, we need to understand that change itself is a difficult process. There is a significant movement in medicine to apply Evidence-based Management. We think it's time for businesses to catch up. The last of the five essential questions is about management systems – the systems that build, support and measure a strategy. This last question is typically the most neglected, but is no less crucial to effective strategy than the others. Even if the other four questions are well answered, a strategy will fail if management systems that support the choices and capabilities are not established as well. Without supporting structures, systems, and measures, the strategy will simply be a "wish list" – a set of goals that may or may not ever amount to anything. To truly win, an organization needs systems in place to support and measure the strategy. It needs robust process for creating, reviewing, and communicating about strategy; it needs structures to support the core capabilities; and it needs specific measures to determine whether the strategy is working (or not). The article this was excerpted from is called A Playbook for Strategy: The Five Essential Questions at the Heart of Any Winning Strategy, and was published in the Rotman Magazine Winter 2013. As always, Roger has produced some well considered and thought provoking work. You should give this article a read for a quick preview of the book's content. We're big fans of Dan and Chip Heath's work. You'll see it referenced in our materials frequently as they undertake very solid research and present their findings in readable and interesting ways. Good leaders excel at converting something ambiguous into something behavioral. Take Terry Leahy, one of the leaders responsible for reversing the fortunes of Tesco, now the U.K.'s No. 1 grocer. One of Tesco's ambiguous goals was to do a better job "listening to customers." Leahy broke down that goal into a set of specific actions. For instance, cashiers were trained to call for help anytime more than one person was waiting in the checkout line. In addition, Tesco received 100,000 queries per week from customers. Leahy's team made sure that all Tesco managers had access to customer concerns. (If you want to listen to customers, you had better make sure your managers can hear what they're saying.) As a result, they learned counterintuitive lessons, such as that customers dislike stainless-steel refrigerators, which remind people of a hospital -- not an ideal association for a grocer. Five Forces vs. The Customer? You may have seen the reports of Monitor Group's recent demise. Steve Denning of Forbes wrote a forceful blog post entitled, "What Killed Michael Porter's Monitor Group? The One Force That Really Mattered." This article has been the basis of a lot of bandwagon jumping lately. Not in a good way in my view. I like strong opinions. As such, I like the Denning piece. But as a skeptical consumer of information, I'm not convinced that the conclusions he's drawn are correct. Are we to believe the very approach that Porter and Monitor were famous for was exactly what lead to their demise? It may be a poetic and clever assertion, but I don't buy it for a second. You'd also have to forgive me for questioning the motive of the article itself, since Denning is clearly a management consultant. It feels a tad righteous and self-promotional as well. But that's not my real beef with the article. I take umbrage with anyone who thinks they can stand back from a safe distance and accurately assess why a particular business succeeded or failed. Looking retrospectively at any event, whether it is a game of schoolyard basketball or the management of a multinational, is incredibly problematic. Suggesting you have the definitive viewpoint is just plain fatuous. There are thousands of moving pieces, decisions, people and contributing and conflicting influences that we could never appreciate or comprehend. Even if we are intimately involved in the enterprise we still don't know the totality of things that were going on around us. If you’ve ever worked in a dissolving business you’ll know what I’m talking about. Everyone on the outside has an “expert” opinion as to why the company failed. And yet, I doubt any of them are fully correct. Just as the validity of predictive forecasting is suspect, so is the validity of retrospective analysis of business failure. It would be nice if things were as cut and dried as some would have us believe. "Killzone" Economics. Why You Should Care. Decreasing interaction costs and sublinear enterprise productivity could create market volatility that can be your friend, or your enemy, when building and managing your enterprise. Are they your friends? Clearly from that definition, this is not somewhere you want to end up as a company. Your odds of surviving a trip to the Killzone are low. To understand interaction costs, you need first to understand transaction costs. Transaction costs, which were the focus of Ronald Coase’s Nobel Prize winning work in the 1930’s, include the costs related to the formal exchange of goods and services between companies, or between companies and customers (ie. How much does it cost me as a company to sell you, the customer, my goods or services?). These costs play a critical role in determining how large your firm can grow. Coase’s work included a linkage between transaction costs and the size of a firm. Simply put, Coase’s Nature of the Firm suggested that a firm will continue to grow to the point where an internal transaction can be outsourced more cheaply than if executed within a company. When a transaction can be accomplished more cheaply outside of the firm, there is no incentive to continue growing. Interaction costs are now more widely used than transaction costs as they include transaction costs, but also add the costs of exchanging ideas and information. Thus they cover a more full picture of economic interactions between companies and their customers. Interaction costs are comprised of search, information, bargaining, decision, policing and enforcement costs. As more and more work is information related in our economy, interaction costs can be incredibly important to watch and manage. Most importantly perhaps, interaction costs are exactly the kinds of costs that are rapidly decreasing due to the ubiquity of connected devices and the growing power of functionality facilitated by this connectivity. So what if your firm is experiencing both decreasing profit per employee from the growth dynamic described by West and Bettencourt, and is also seeing interaction costs drop as value chain activities migrate more to information-driven interactions so as to be more exposed to interaction cost decreases? Wouldn’t that lead to even more volatility? Wouldn’t that that promote unequal rates of change inside and outside of companies? It’s a hypothesis at this point. And it’s probably not original. I’m inclined to invoke Bob Sutton’s law in this regard, “If you think you have a new idea, you are wrong. Somebody else probably already had it. This idea isn't original either; I stole it from someone else." If there is any validity to the hypothesis, it might suggest there is a systemic way to identify which markets and companies are ripe for disruption. If interaction costs are dropping around you in your market, and your profit per employee is declining, perhaps it’s time to think about disrupting yourself before someone else does? At the very least, you’d better get a grip on your interaction costs so they are in line with the market. If you’re an insurgent, this seems to be a particularly good time. Dropping external interaction costs and decreasing profit per employee might suggest a market which is stumbling into your Killzone.